2). Click "Tools", then "Macro" and then "Security"
2). Click the "Office" logo button at the left top corner and then select "Excel Option"
3). Click "Trust Centre", then Click "Trust Centre Settings" and then click "Macro Settings"
4). Check the box "Disable all macros with notification"
3). Double Click the Excel file named "Setup"
5). 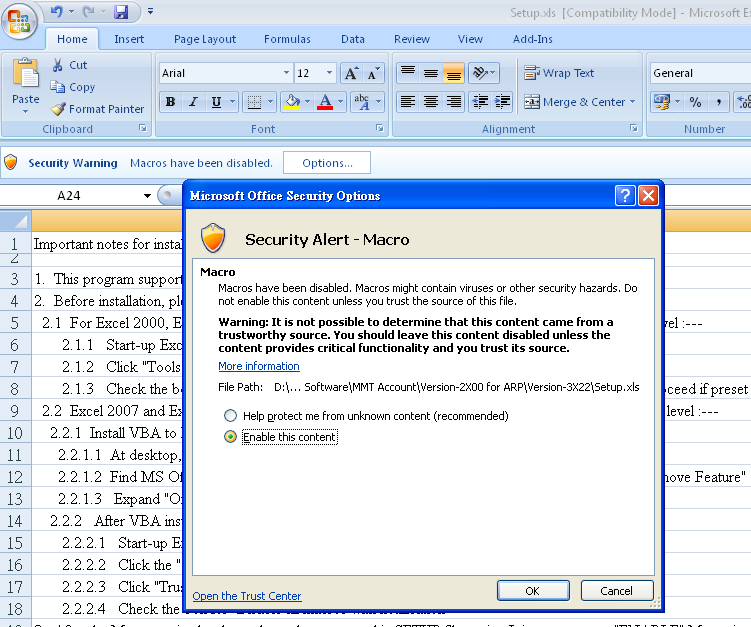 For Excel 2007, there is a bar showing the wording "Security Warning - Some active content has been disabled" and an "Options" button. Click the "Options" button. It will prompt a message of Security Alert. 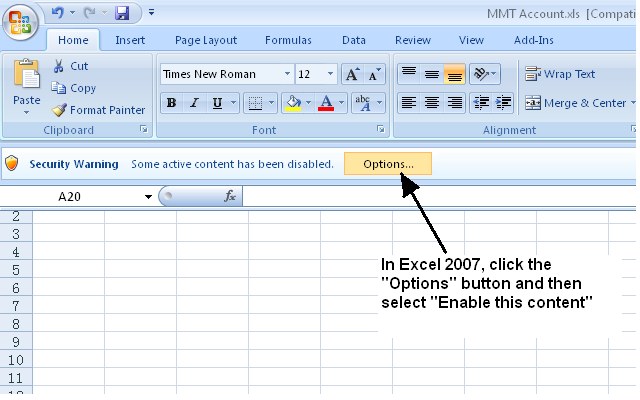 ( For Excel 2010 and 2013, the procedure is similar except that the "Enable this Content" button will appear instead of the "Options" button). 6). MMT Account System will start to install into the computer. 7). During installation, the system will prompt and guide users to enter the necessary company data. Follow the guide to input the company data. A data file will be created. The file name of the data file is in the format of "CompanyName-yyyy" . The suffix "yyyy" represents the accounting year. Upon successful installation of the system, it is necessary to setup initial Account data before data entry can be proceeded. 1). At the Main System Menu, click the "Company Data" button which is located at the lower right-hand side of the screen. The Company information screen will show up. 2). Click the "Set-up Initial Account data" button which is located at the top right-hand corner. An Excel sheet for inputting the last date of previous accounting year and a default chart-of-account will be shown on the screen. 3). Enter the last date of the previous accounting year at Cell C10 ( in the form yyyy/mm/dd). 4). Click the "Save & Return to Main Menu" button to save the data. 5). At the Main System Menu, click the "Sales, Purchases, Inventory, AR/AP" button. The Sub-ledger Menu of "Sales, Invoicing and AR accounting" will then be shown on screen. Note: In case the screen shown is not the one mentioned above, please click the "Sales & AR Accounting" button at the bottom od the screen to get into the Sales & AR sub-ledger screen. 6). Click the "Account Setup" button. The "Setup Accounts for AR/AP" screen will be shown. Users are allowed to add as many Bank Accounts for payments as they wish. Simply click the button located next to the "Add Account # " input box to select the required account number. Click the "Save" button each time when an account is added. To set the default bank account or to delete a bank account, simply highly the account number and the required buttons will appear on the screen. 4). Starting from Row 15, the default Chart-of-Account is shown. Addition, Deletion or Amendment to the Account numbers are allowed. For users without any preference of their own Chart-of Account, they may adopt the default Chart of Account and may simply click the "Save & Return to Main Menu" button to save it in the system. i). For account numbers other than level 1 accounts, next higher level account must exist. 5). After the Chart-of-Account has been well-defined, input the closing balance date of previous year to the proper cells. Please note that the total amount of credits must be exactly the same as the total amount of debits. The system will not proceed to save data with unbalanced amount. 8). At the Main System Menu, click the "Sales, Purchases, Inventory, AR/AP" button. The Sub-ledger Menu of "Sales, Invoicing and AR accounting" will then be shown on screen. Note: In case the screen shown is not the one mentioned above, simply click the "Sales & AR Accounting" button at the bottom of the screen to get into the Sales & AR sub-ledger screen. Product number -- it is used to communicate with customers. So, product numbers will appear on Sales orders, Invoices, Credit notes and etc. At Product setup, each product of a stock item is linked to its corresponding stock number. Product number may be the same or different from its linked stock number. Part number ------- it is used to communicate with suppliers. So, part numbers will appear on Purchase orders and Debit notes. A purchase part is identified by its part number as well as its supplier. Thus, same part number but from different suppliers are allowed no matter whether the parts from different suppliers are of the same item or different items. At Purchase part setup, each part number of a stock item is linked to its corresponding stock number. Same case as the product number, part number may be assigned the same ( or different ) from its corresponding stock number. Take the case that a company has 2 stock items with stock numbers "A00011" and "B00022"
Customer A purchases A00011 as "Cleaning set"
Customer B purchases A00011 as "Rust Protection oil"
In order to pre-define the product descriptions and the different prices for Customer A and Customer B, 2 product numbers are assigned to this item. Product number "P24680" is defined as "Cleaning Set"
Product number "P13579" is defined as "Rust Protection oil"
In this case, at product setup, both P24680 and P13579 are linked to the stock item "A00011" and the product number "B00022" is linked to the stock number "B00022"
When issuing invoice for selling stock number A00011, P24680 will be used for customer A while P13579 will be entered into the invoice for customer B. In this case, the pre-defined product descriptions and corresponding prices will be picked automatically to the invoice. Suppose there are 2 suppliers ( Supplier C and Supplier D ) for the stock item A00011. The item identification used by Supplier C is "C2468" and Supplier C insists their identification number be shown on the PO otherwise they will not accept the order. Supplier D can accept customer's part number. In this case, a part number "C2468" from Supplier C is assigned to the stock item "A00011". And for simplicity, part number "A00011" ( same as the stock number) is assigned for Supplier D.
b). At Product setup and Purchase part setup processes, if the stock number is selected first, the product description will be shown on the input box and may not need to re-type again. Sales Orders are to record confirmed orders from customers. In order to input a sales order ( or an invoice), it is a requirement that the customer data and product data have been already established. Sales Order can be created regardless whether there are sufficient stock of the products or not. One main reason for recording Sales orders in the system is because the system can help to generate the Material Lacking Reportto help users to plan the materials. Material Lacking Report is a very useful tool to report all the required materials ( both the products and the components to build products ) to meet all open sales orders. Sales Order can be converted to Invoice when all the required stocks are available. Full or Partial conversion of a sales order to an invoice are allowed. Amendment or deletion to a Sales Order is allowed. Invoices are treated as selling of products. When an invoice is created and saved, the system assumes the products have been sold. In case some products involved belong to stock items, the stock will be deducted and the inventory value will also be adjusted. In order to input an invoice, it is a requirement that sufficient stocks are available at the time an invoice is created. Invoices are allowed to be created either with or without going through Sales orders when sufficient stocks are available. 1). Entry of an invoice with date earlier than the start date of the accounting year is not allowed. ( Except for the first year of the company. The software allows data of past year be inputted to the system for tracking. However, the inventory will not be amended and the balance sheet will not be changed for data of previous year ). 2). Amendment or deletion to an invoice is allowed except payment (either partial or full payment ) has been received. 3). To amend or delete an Invoice, input the Invoice # to the form and then click "Edit" button to proceed. The "Edit" button will not be shown if the Invoice is not editable ( i.e. payment has been received or the invoice date is earlier than the date range of the accounting year). 4). Each Invoice is limited to a maximum of 20 items. This is to standardize each invoice be printed in only one sheet. Same case applies to the Sales Orders and Credit Notes. To convert a Sales Order to Invoice, go to the Sales Order input screen and click the "Convert SO to Invoice" button to proceed. In case an invoice is created by converting from a sales order, it is reminded that the invoice be properly saved otherwise the conversion will not be complete. The sales order will be deducted for the products converted at the time the "Convert to invoice" button is clicked. However, if changes are made to the invoice adjusting the quantity of the products, the original sales order will not be automatically updated for any changes made in the invoice. Users are responsible to amend the sales order their own. Thus, it is highly recommended that any changes to the quantity or price should be done at the sales order rather than at the invoice after conversion. If users close the invoice without saving it, the originated sales order will return to its status as if no conversion was made. Once a sales order has been fully converted to invoice, the sales order will be completed removed from the system. To input a purchase order, the supplier data and purchase part data must have been established in the system. On receiving of purchase items, receiving update should be proceeded. First, input the related PO # into the PO# box of the PO form. Once an outstanding PO# is entered, the right side of the form will display a receiving screen for inputting the receiving details. 1). Partial receiving is allowed. 2). Receiving Date must not be a future date. ( Except for the first year of the company The software allows data of past year be inputted to the system for tracking. However, the inventory will not be amended and the balance sheet will not be changed for data of previous year ). 5). To amend or delete a Purchase Order, input the PO # to the form and then click "Edit PO" button to proceed. The "Edit PO" button will not be shown for closed Purchase Orders. 6). Each PO is limited to a maximum of 20 items. This is to standardize each PO be printed in only one sheet. Same case applies to Debit Notes. IT Shareware - Listing of shareware and freeware software sorted by category.